in main traffic to one of my client's websites whilst also significantly improving their conversions! Would you like to know how I can help you achieve this? Having worked for so long as a marketing consultant and providing “done for you” marketing services, my mission is simply to raise the bar. It became frustrating to see consultants and agencies use technological speak to confuse clients whilst underperforming on what they offered as services therefore producing weak advertising in a time that the competition within the marketplace has never been stronger. My mission is to provide a high value service, adding value to the businesses that I work with by educating and empowering the people within those businesses who are responsible for the marketing. By doing this, I also aim to improve the experience of the clientele of those businesses when they are exposed to marketing and sales information. Let’s make marketing effective again. Let’s make it fun. Let’s make it engaging! I began my marketing career in 2002, working for a property development company in Manchester. As part of a small and dynamic team, my responsibilities included producing the marketing collateral for property exhibitions and to sell off-plan properties. During this time my passion for marketing grew and it wasn’t long before I was testing new methods and developing my skills as a professional affiliate marketer (selling other people’s/businesses’ products for a commission). I soon left the property world behind to concentrate on my affiliate marketing, having already gained invaluable experience across several marketing disciplines and public speaking at property events. And other skills in developing and implementing a complete marketing strategy. It wasn’t long before various contacts of mine started to take note of my performance and passion, and began to ask for my help in marketing their own businesses. In October 2014, I was then headhunted to work at The Business Growth Hub in Manchester (a EU funded business support service, helping business owners and entrepreneurs in Manchester). Being specifically tasked with rewriting and running their Marketing and Promotion, Market Research and Digital Marketing workshops. Over the next 18 months, my workshops became some of the most popular and well regarded on offer, regularly being oversubscribed. In addition to the workshops, I also ran marketing clinics offering the individual business owners the opportunity for 1 to 1 support for any marketing issue they may have. These clinics also became oversubscribed, receiving fantastic feedback from the participants. "I have no hesitation in recommending Chris as an outstanding digital marketing consultant and presenter. Whilst running a growth start programme for businesses across Greater Manchester I needed someone to advise on all things marketing and in particular digital marketing, knowing Chris' reputation I specifically sought him out. To say I was not disappointed would be an understatement, Chris surpassed all expectations delivering perfectly tailored advice in both one to one consultation and workshop settings. I received countless testimonials from the companies he helped grow, stating his advice was always bespoke to the needs of the company, helping them meet and exceed their growth aspirations. On seeing the benefits Chris delivered he was quickly utilised by other departments to deliver to their clients, businesses of all sizes, undertaking all types of delivery from the general to very bespoke technical applications for complex marketing campaigns and e-commerce set ups. 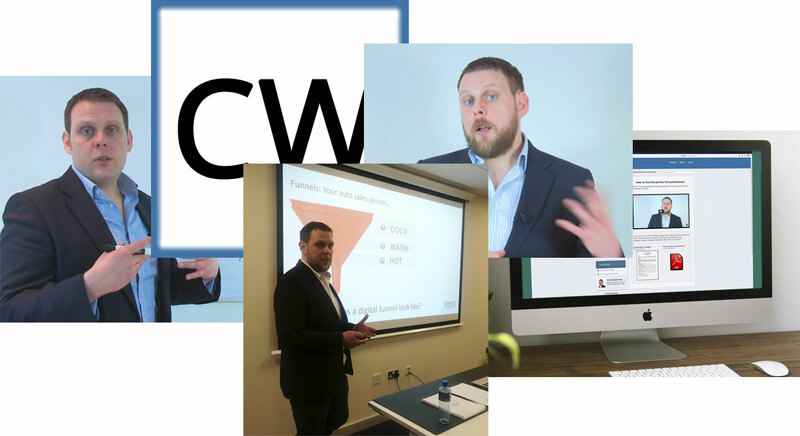 As a presenter Chris is able to deliver complex information in a incredibly easy to understand and engaging way and as a consultant he is quick to understand the true and holistic needs of a company to deliver ways to drive pure growth and profit." I was also asked to speak on digital retargeting campaigns at Venturefest (Manchester 2015). A talk, which was received by several hundred people, receiving high feedback due to my “interactive and fun presenting style”. In February 2016, I took up a part time role as the Digital Marketing Director for Protelhealth Ltd alongside my consultancy. I sat on the board up until Dec 2017 and was responsible for all of the digital marketing efforts of the company and associated brands. During this time, I helped the start up to build an effective marketing team and within 12 months of assuming the role had met and exceeded the targets set by the board. By training the team in multiple marketing disciplines and taking ownership of the overall strategy with the help of my team, I was able to increase traffic to the main website by 1,733% whilst also improving the conversions of the ecommerce store. Rory Adam | Finance Director at Protelhealth Ltd.
"Chris was absolutely brilliant in helping us better understand and navigate the minefield of ecommerce. He has the ability to make even the most complicated situations/processes simple and easy to grasp (irrespective of your level of knowledge), underpinned by practical examples that generate both long-term benefit and, essentially, profit!" I now spend my time focussed on consultancy and speaking combined with the role of Marketing Director of Energised Edge Ltd. A company which specialises in helping ecommerce stores use email marketing effectively. Alternatively, to find out more and discuss how my consultancy would help your business please visit my consultancy page. I like to work hard, which means I need a little downtime every now and again! And, in order to be my best for you, there are certain things that help me reset, recharge and perform at my best. For me, nothing beats getting out into the mountains. I love all sports in the outdoors and can often be found visiting places like Chamonix to enjoy a spot of climbing/mountaineering. Or, hillwalking a little closer to home in the Lake District or Snowdonia in the UK. I am also a passionate snowboarder, enjoying travelling to new places to sample the off-piste runs, but I also love returning to my favourite resort, Lech in Austria. When I want to do something a little less “extreme” I enjoy spending time with my dog and drawing (especially dogs!). I also love following Wigan Warriors RLFC. Being a Wigan lad, it was inevitable! The final thing I would class as a hobby is travel (although I also get to travel, thanks to consultancy and speaking). I love to visit new places and immerse myself in the local culture, trying regional food and customs.